For ye are all the children of God by faith in Christ Jesus (Gal. 3:26). They were trying to make the Savior look bad in front of the people. They didn’t want people to believe in Him. If people believed in Jesus Christ, they wouldn’t follow them (the chief priests and elders). But Jesus knew what they were trying to do, so He said, “I also will ask you one thing, which if ye tell me, I in like wise will tell you by what authority I do these things. Now, John the Baptist believed in the Savior and knew of His mission. Before his death, John had told people that “I indeed baptize you with water unto repentance: but he that cometh after me [Jesus Christ] is mightier than I … : he shall baptize you with the Holy Ghost, and with fire” (Matt. 3:11). When the chief priests and the elders heard Jesus’ question, they were worried. They realized that if they said that John baptized people with the proper priesthood authority, Jesus would ask them why they didn’t believe John and follow Him (the Savior). But if they said that John did not have proper priesthood authority, the people wouldn’t believe them, because the people did believe John. “But what think ye? A certain man had two sons; and he came to the first, and said, Son, go work to day in my vineyard. “He answered and said, I will not: but afterward he repented, and went. “And he came to the second, and said likewise. And he answered and said, I go, sir: and went not. When we learn the gospel, have faith in the Savior, repent of our sins, are baptized, receive the Holy Ghost, choose the right, and study the scriptures, we are following Jesus Christ. Jesus Christ was baptized by John the Baptist. We can follow Jesus’ example by being baptized, too. To find out what two things we must do before we are baptized and what happens after we are baptized, cut out the pictures and glue them in place in the right order. 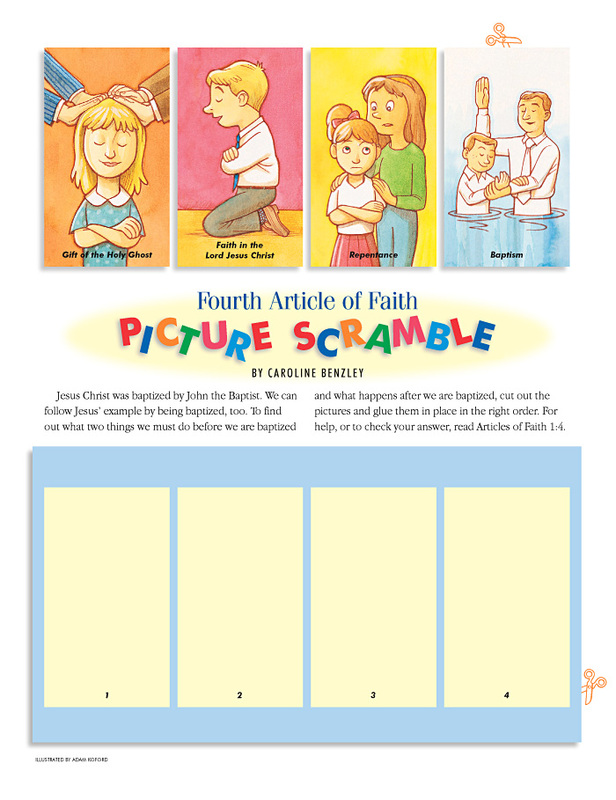 For help, or to check your answer, read Articles of Faith 1:4.